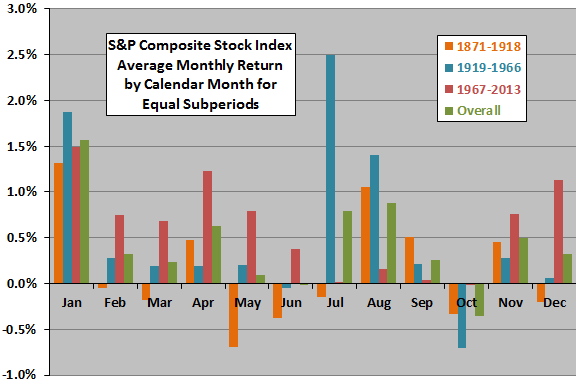 The following chart shows the average return by calendar month for Shiller’s S&P Composite Stock Index over the entire sample period, with one standard deviation variability ranges. The average return for all 1,715 months in the sample is 0.43%. At 1.57%, January has the highest average return of all months. January also has the lowest standard deviation of returns across monthly measurements (2.85%), so this high return is not compensation for high variability. October is the worst month, with average return (-0.35%). Is this January effect persistent across subperiods? The next chart compares average calendar month returns for the S&P Composite Stock Index over the entire sample period and three equal subperiods (47-48 years each). 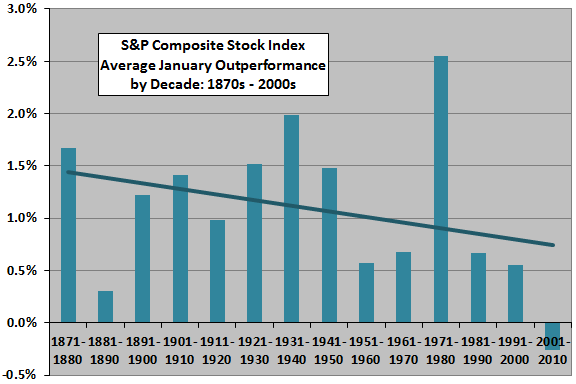 The performance of the stock market is consistently strong on average during January, and January is the best month for two of three subperiods. For greater granularity and trend analysis, we examine relative performance during January by decade. The next chart shows the outperformance of the average return for January relative to the average monthly return for all months by decade over the entire Shiller sample period, along with a best-fit linear trend line. The trend line indicates that the magnitude of any January effect may be declining, but variability is large and sample size in terms of number of decades (14) is small. For even greater granularity, we examine the effect by year. The next chart shows the outperformance of the return for January relative to the average return for all months by year over the entire Shiller sample period, along with a best-fit linear trend line. The trend line again indicates that the magnitude of any January effect is declining. Since the Shiller data calculates the monthly index level as the average daily close during a month rather than monthly closes, we compare the above results to those for monthly closes of the S&P 500 Index. 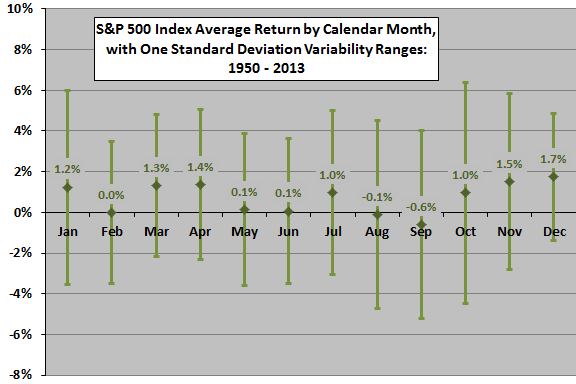 The next chart shows the average return by calendar month for the S&P 500 Index over the available sample period, with one standard deviation variability ranges. For this calculation, we approximate the January 1950 return using the opening level for that month (no December 1949 close is available). The average return for all 768 months in the sample is 0.72%. At 1.2%, January has the fifth highest average return of all months, behind December, November, April and March. 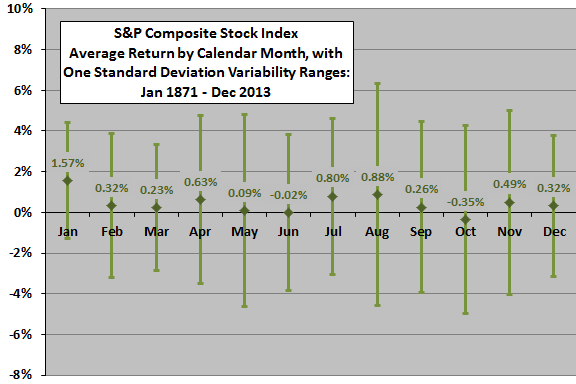 January has the second highest standard deviation of returns (4.8%), trailing only October. Is performance during January persistent across subsamples? 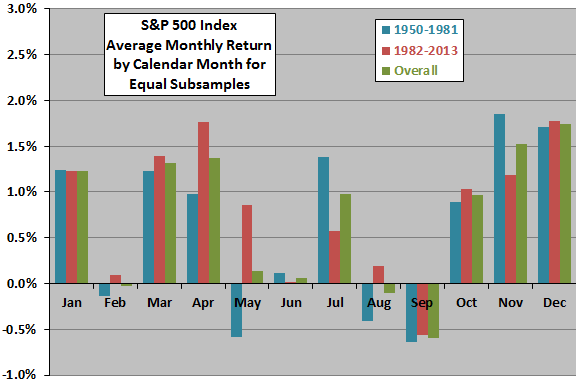 The next chart compares the average return by calendar month for the S&P 500 Index over the available sample period and two approximately equal subperiods (32 years each). During the first (second) subperiod, the performance during January is in fourth (fourth) place among the 12 calendar months. For greater granularity and trend analysis, we examine relative performance during January by year. The final chart shows the outperformance of the S&P 500 Index return for January relative to the average S&P 500 Index monthly return by year over the available sample period, along with a best-fit linear trend line. 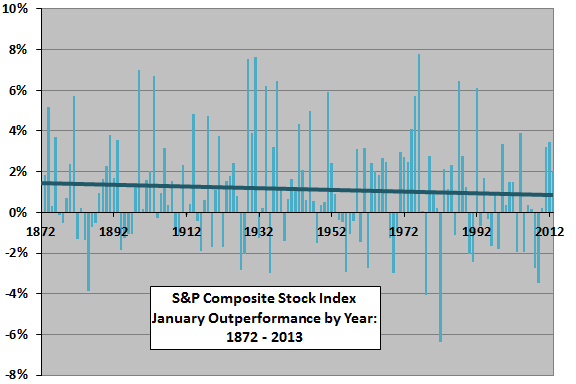 The trend line indicates that any outperformance during January disappears over time. 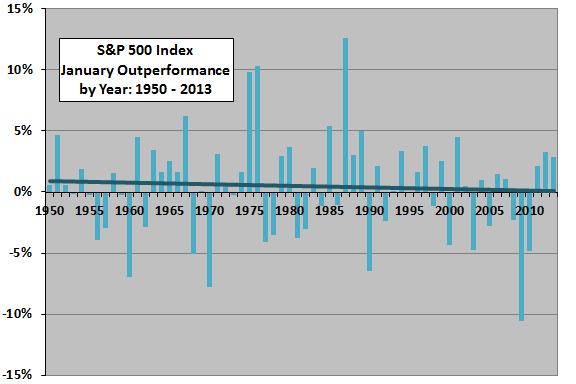 In summary, evidence from long run data suggests that the conventional wisdom regarding outperformance of the U.S. stock market during the month of January is mixed and may derive from older data. As noted, the monthly stock index level in the Shiller data is the average daily close during the month, and not the monthly close, thereby blurring monthly return calculations. The indexes used do not account for dividends, which would likely boost performance of quarter-end months. Indexes ignore costs of maintaining liquid tracking funds, thereby tending to overstate achievable returns. Sample sizes for the Shiller data by decade and S&P 500 Index subperiods are not large. See “Turn of the Year and Size in U.S. Equities” for detail on recent behavior of U.S. stock indexes during January.